This week we're feeling excited about the dark features of every space. From hardware to wall color, and everywhere in between, we're loving it! We weave black details into almost every project, and you can spot it galore in our Orange County Remodel. This week was our last week of spotlighting it on the blog, so make sure to get caught up. Start with part one's webisode and photo reveal to enjoy the entry, sitting room, and dining room. See the kitchen and living room transform in part two's webisode and reveal! Wrap it up by enjoying part three! There's two bedrooms, two bathrooms, a cool play space/office, and a darling laundry room. You can enjoy it all in a webisode and photo tour. Let's start with this bathroom. 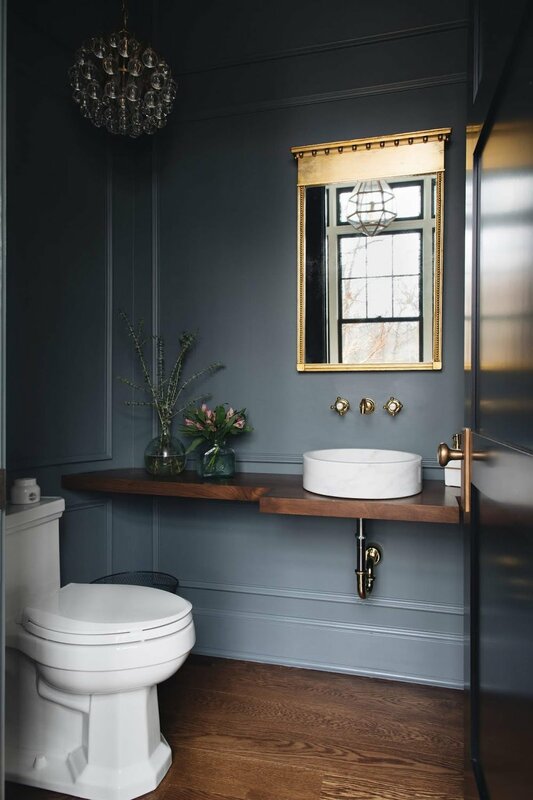 The full commitment to dark makes the brass mirror contrast in the most beautiful way. This is some pretty big commitment to dark paint as well. The half-painted wall almost makes more of a statement, no? It's whimsical for a play space, while we also see it working as children age and require a more sophisticated space for activities like homework. The black is subtle here, but you can't miss it! The hardware, the mirror frame, the shower curtain stripes! We love it all. Black is even more subtle here, but don't miss that sink!! The dark beams, dark wood floors and black paint are a match made in heaven. There's no black in this space and we're totally fine with it. It's just pretty! !